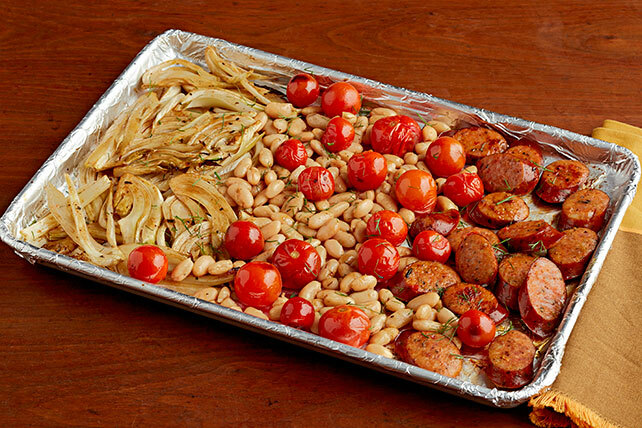 Put Healthy Living fennel-sausage on the menu with our Italian Sausage Sheet-Pan Supper! This fennel-sausage dish is ready to serve in just 45 minutes. Cut stalks and fronds from top of fennel bulb. Chop enough of the fronds to measure 1 Tbsp. ; reserve for later use. Discard stalks and remaining fronds. Trim root end of fennel; remove and discard any tough or discolored outer layers. Cut fennel bulb lengthwise in half; remove and discard fibrous core. Cut remaining fennel into 1/4-inch-thick slices; place in medium bowl. Add 2 Tbsp. dressing; mix lightly. Line 15x10x1-inch pan with foil; spray with cooking spray. Spread fennel mixture onto half the prepared pan. Bake 15 min. Meanwhile, toss tomatoes and beans with 2 Tbsp. of the remaining dressing. Drizzle fennel with remaining dressing; stir until evenly coated while keeping fennel on same side of pan. Add tomato mixture and sausage to other side of pan. Bake 10 to 15 min. or until fennel is tender. Sprinkle with reserved chopped fennel fronds. Prepare using OSCAR MAYER Selects Uncured Smoked Roasted Tomato & Onion Sausage.